It's Day two of Digit-al Dozen Nature Week. 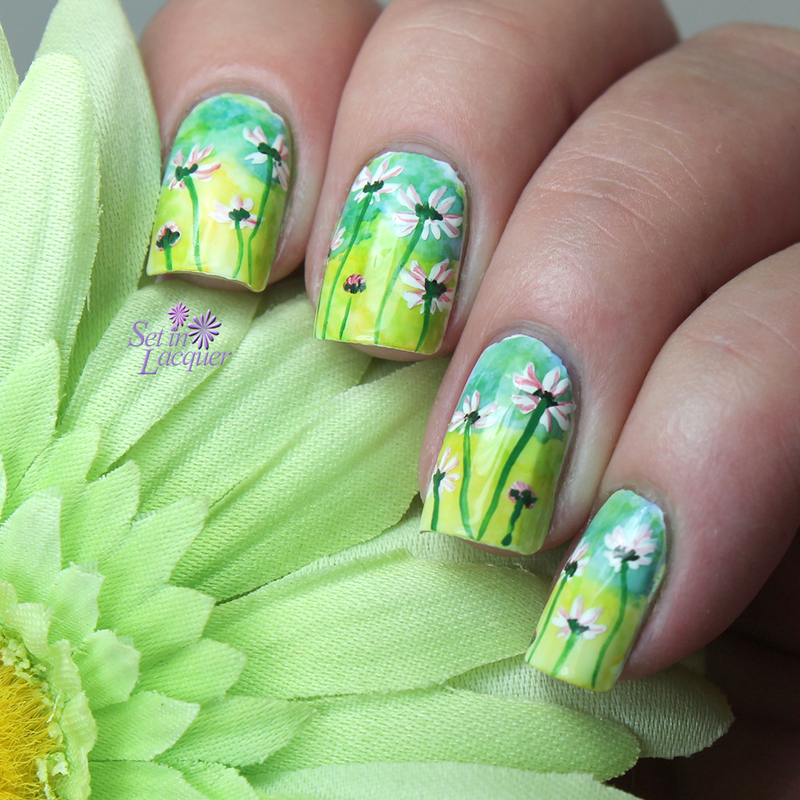 Nature means I can create the things I love - florals and landscapes. Today is a fun floral. I used alcohol inks for the base. 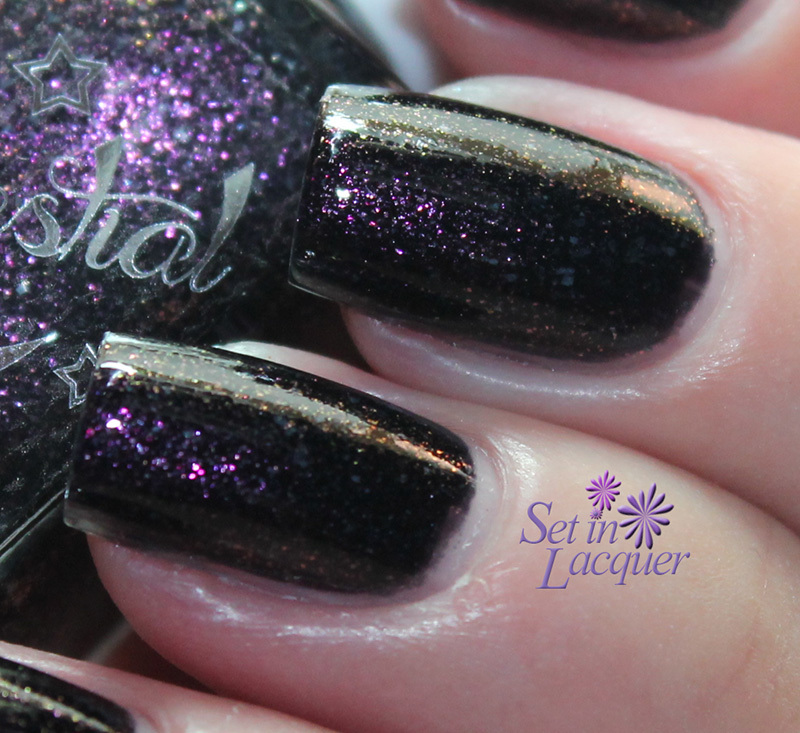 To protect my nails and cuticles from getting stained, I applied Crystalline Nail Veil from Color4Nails. However, I didn't get it close enough to the edges and did end up with some staining. But it washed off easily in the shower. I used acrylic paints for the flowers and stems. I love working with acrylic paint. It doesn't dry out quickly, which means you can use a very small amount. And if you feel like you really messed it up you can wash it off - providing you applied a good top coat before using the paint. The Digit-al Dozen is a small group of diverse nail art bloggers that post nail art inspired by a new monthly theme for five days in a row. You can find us blogging away the second week of each month! See the other nature looks below. 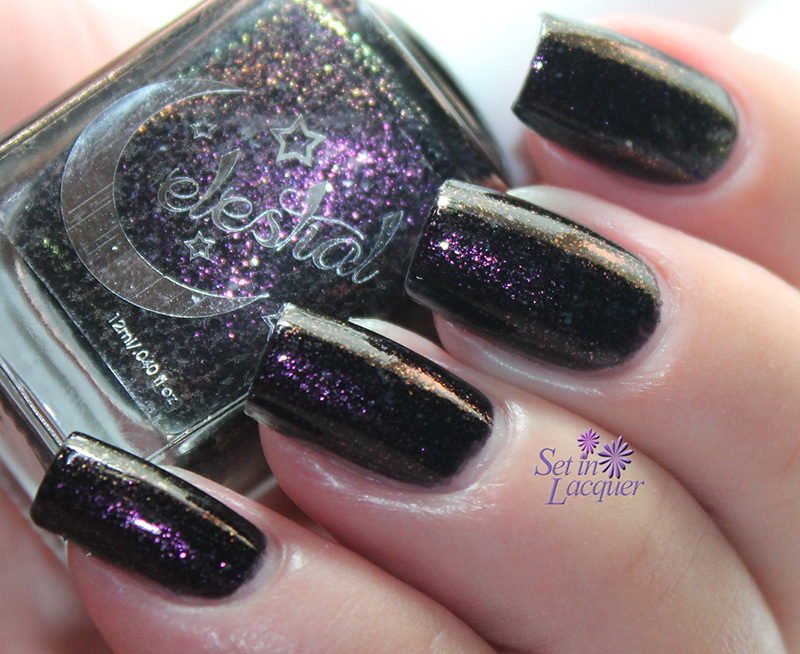 Crystalline Nail Veil was previously provided to me for an honest review. All opinions are my own. 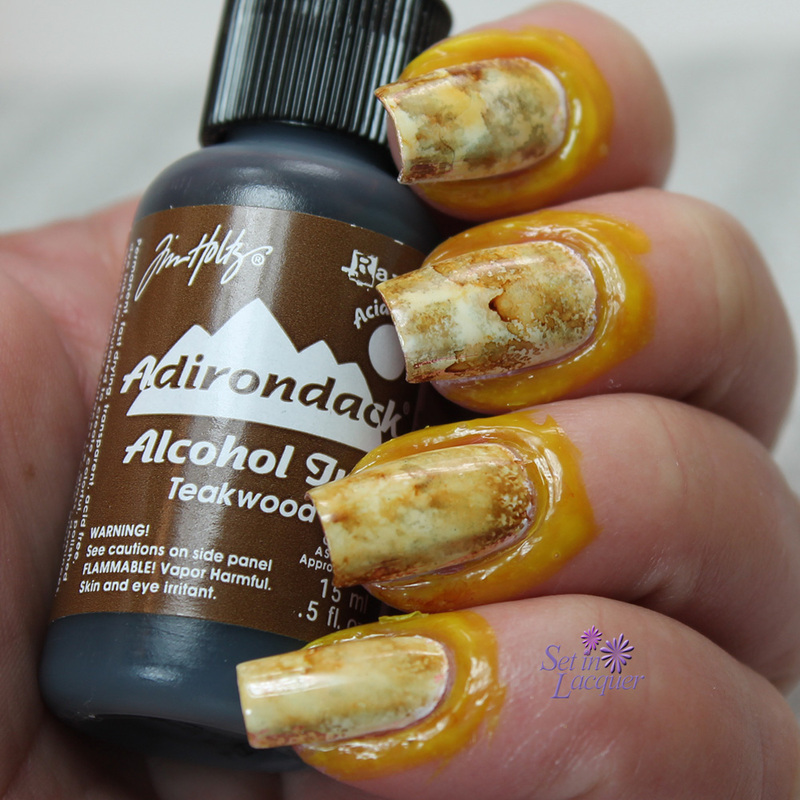 There are so many awesome ideas popping up in the nail world. 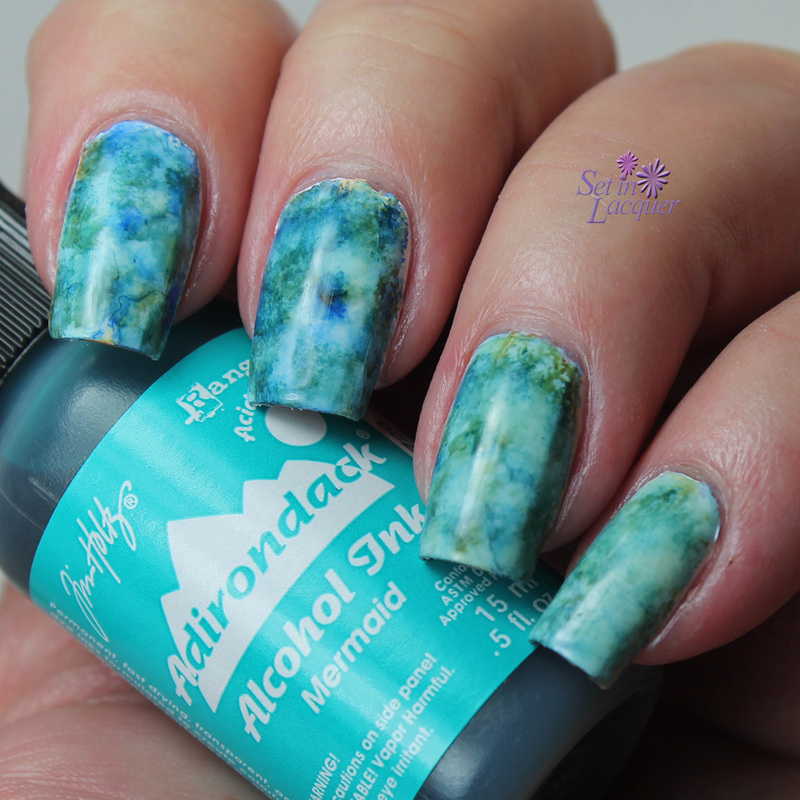 One of the ideas that caught my attention is the alcohol ink marbled look. I have been wanting to try it for so long. But I imagined it as a messy adventure. I received a product last week that pushed me to try it. 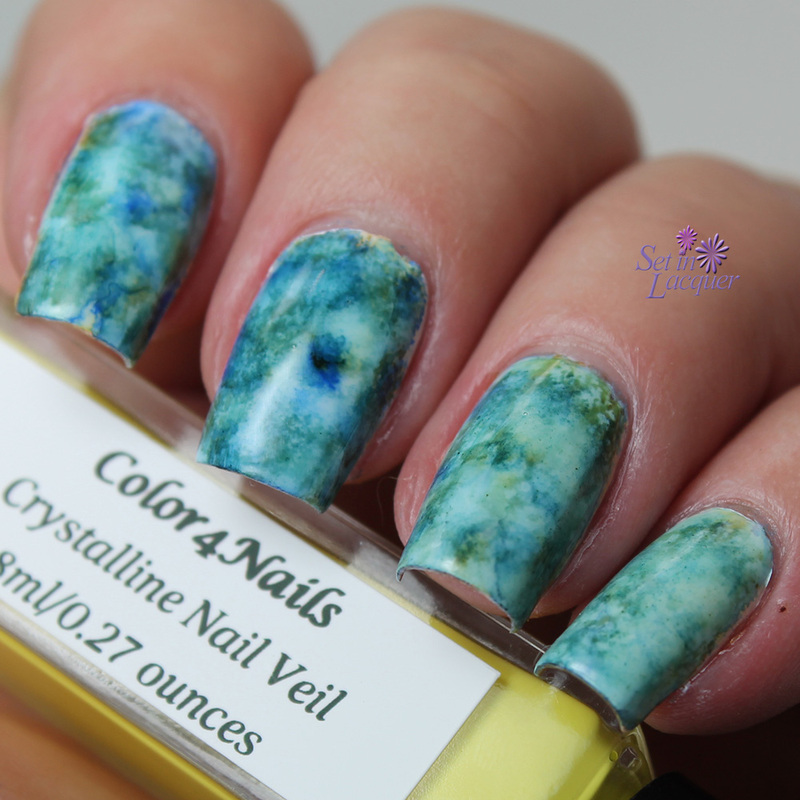 Crystalline Nail Veil from Color4Nails allowed me to put the dye on my nails and not my skin. I started off with a base color of KBShimmer Eyes White Open. This white is perfect for nail art. Then I applied a top coat of KBShimmer Clearly on Top. I wanted a completely smooth surface to put the dye on. Once this was dry, I applied Crystalline Nail Veil to my cuticles around the white polish. I made sure to cover any part of the nail that I didn't want ink to get on also. The small striping brush from the Nail Veil made it easy. It does have a strong odor to it. But it dissipates quickly. I allowed it to dry about five minutes. If you are allergic to latex, do not use this product. I tore a cosmetic sponge into tiny pieces and added two small drops of alcohol ink to a small section. Then using tweezers, I dabbed it onto my nail. I added the ink to my nails pretty randomly. I learned I like to add a little of alcohol to my sponge as it makes the marble look a little more muted. I started off with the Teakwood color. I bought a set of three inks at Hobby Lobby. They are $9.99 for the set; and of course I used one of their handy 40 percent off coupons. And as it only takes a couple of small drops of ink, it will last for quite a while. I actually like the Teakwood on its own. But as I was experimenting, I decided to add the other colors. I repeated the process with the Indigo and Mermaid colors. The ink dries really quickly, so there wasn't much waiting to suffer through. I used tweezers and peeled off the Nail Veil. It was oh-so-easy. Without it, I am pretty sure I wouldn't have tried this technique for a while. Alcohol inks are a stain, so they will stain your skin. 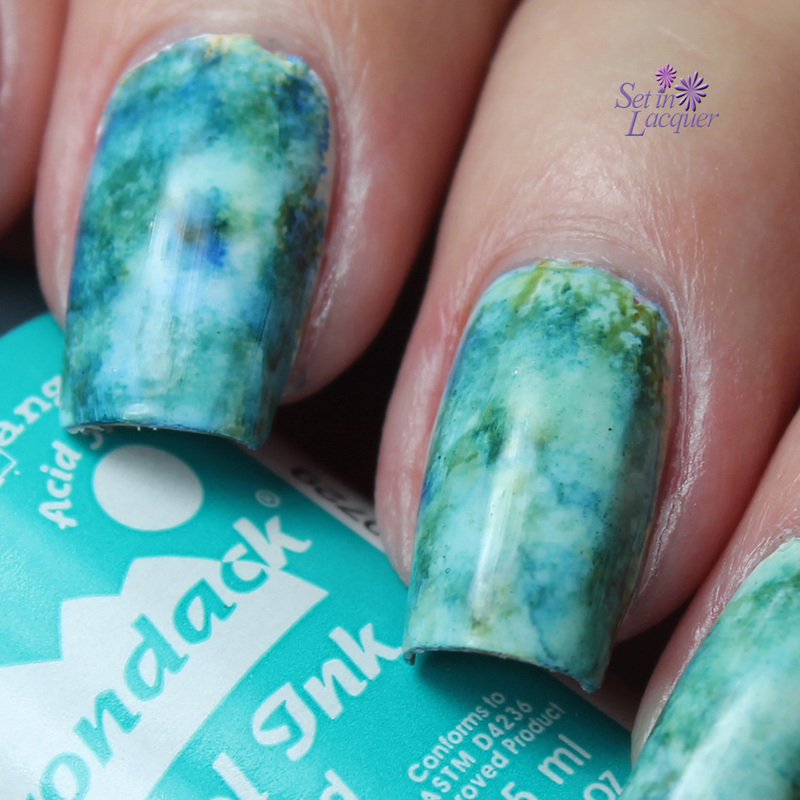 I am pleased with this marbled look and I can't wait to try it some more. In the meantime, I will be using Nail Veil for marbling and gradients. I am not sure who initially came up with this ingenious idea of using alcohol inks. But I took my lead from Ten Little Canvases. You can see her YouTube video here. 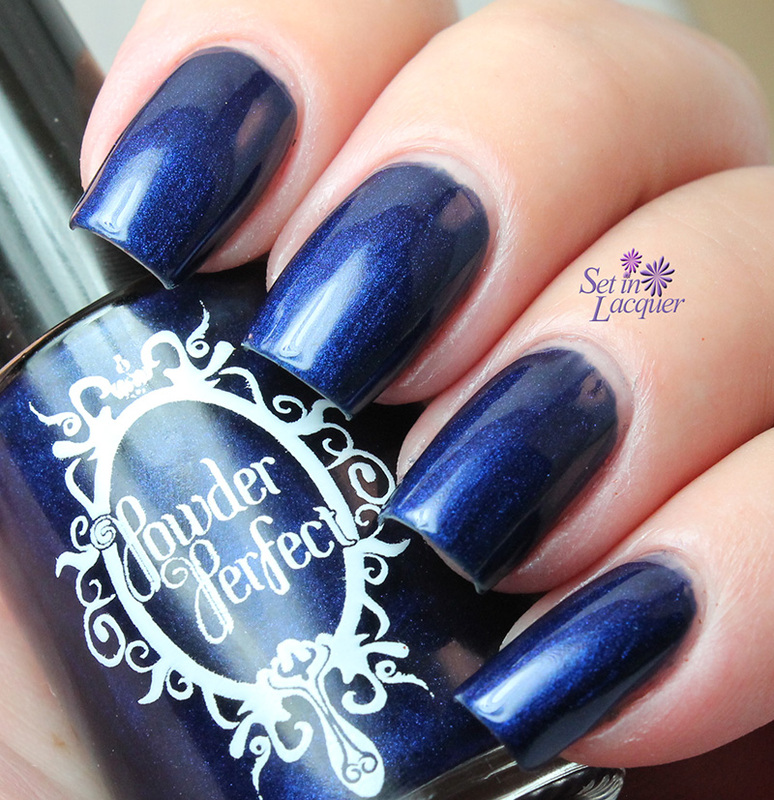 Follow Color4Nails on Facebook to stay current on new releases, sales and launches. 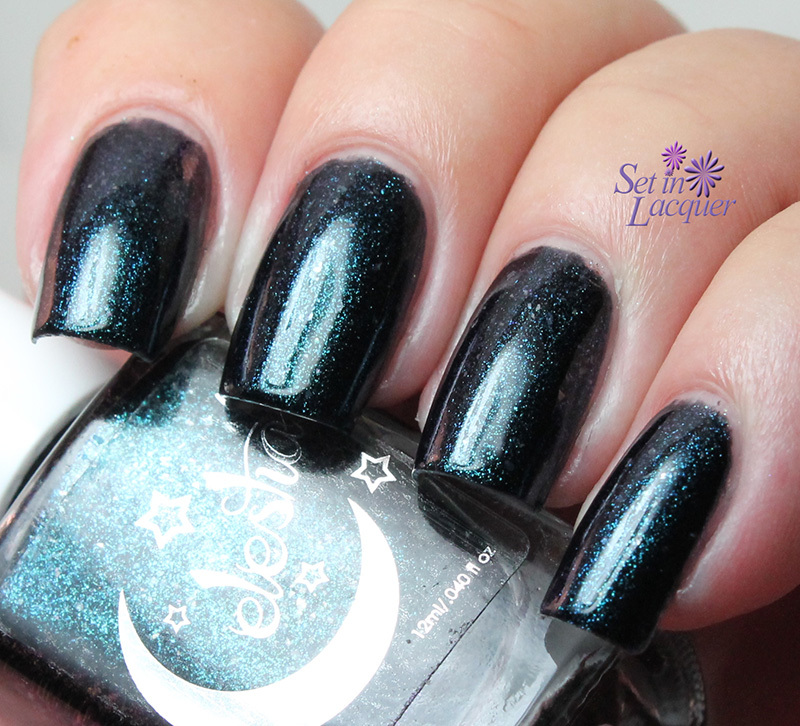 I have a simply mesmerizing polish to share with you - Celestial Cosmetics Bay of Rainbows. 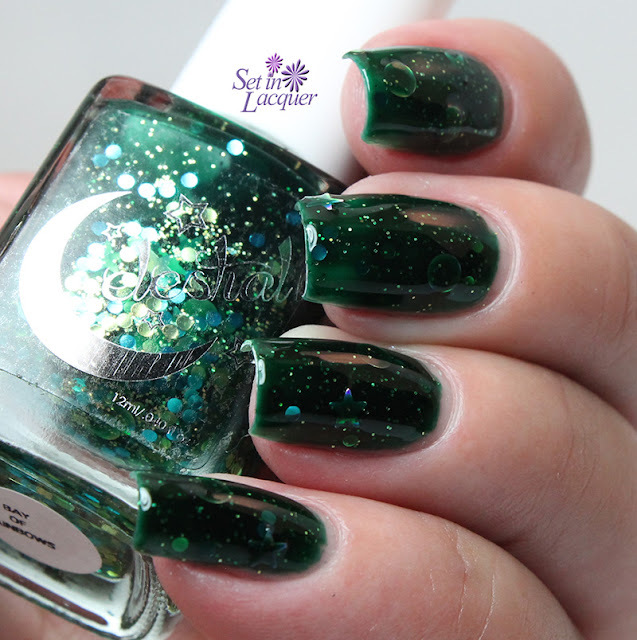 Bay of Rainbows is a deep green jelly polish that is packed full of large gold dots, gold micro glitter, smaller gold and turquoise dots and silver stars. The final illusion is one of depth and dimension. It applies well and doesn't require any fishing for polish. 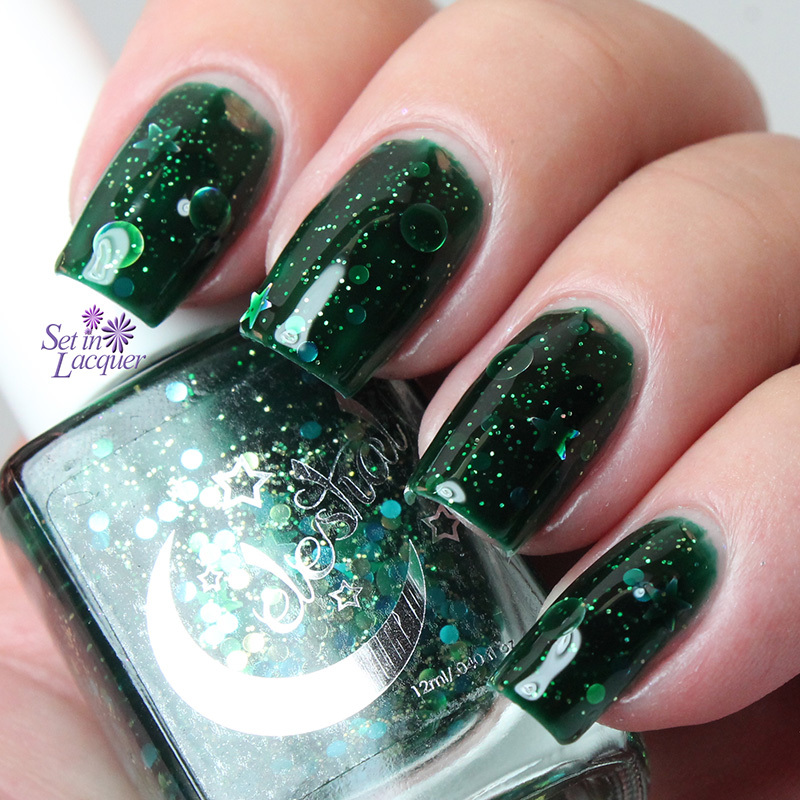 The glitter shines bright, even through the jelly polish. Let's take a look! This is three coats with a top coat. 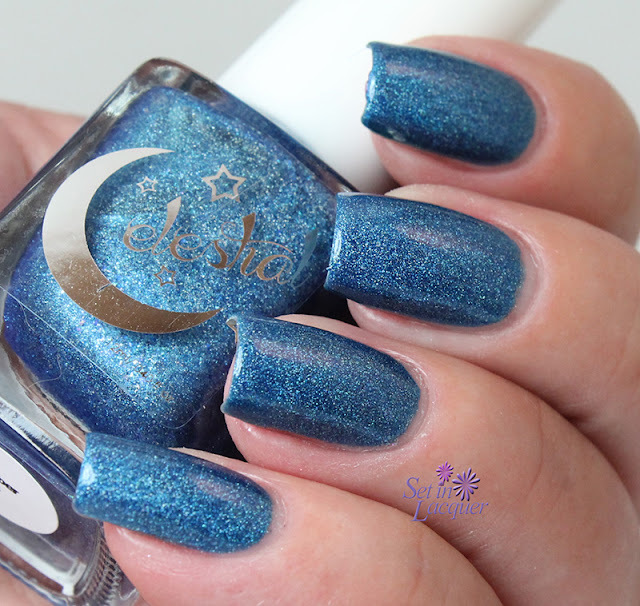 This stunning, 3-dimensional polish is available from Celestial Cosmetics and Color4Nails. 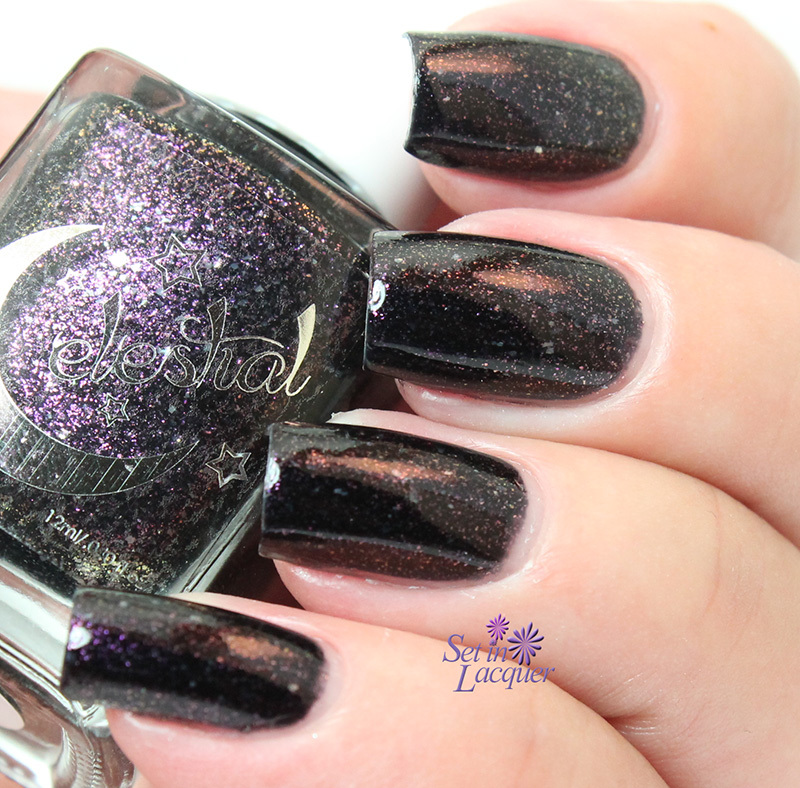 Celestial Cosmetics is Australian owned and made. They create 5 Free unique handmade nail polish. Follow Color4Nails on Facebook and Celestial Cosmetics on Facebook to keep up with new release on this collection, and more. 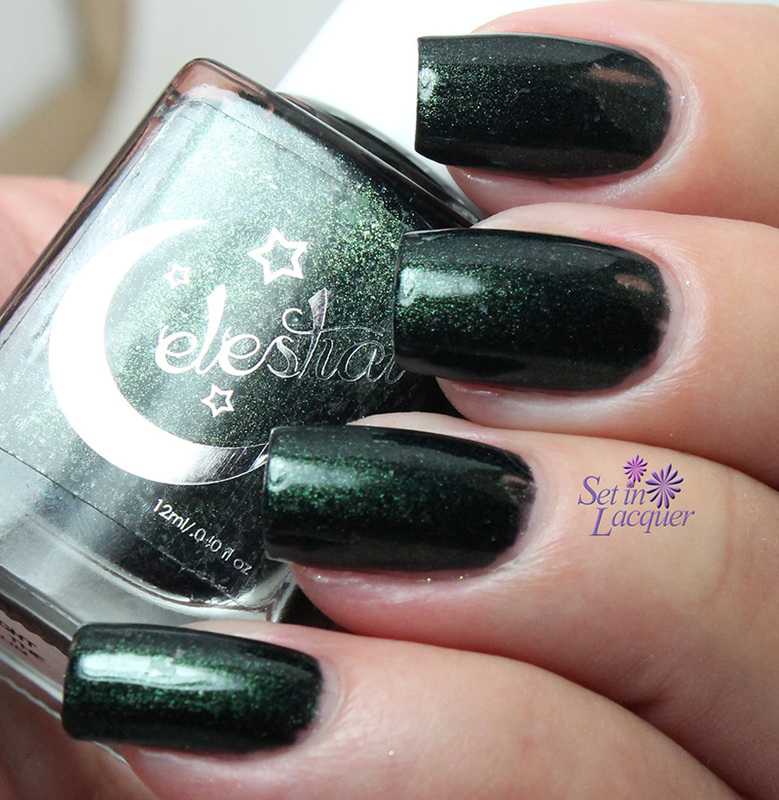 Celestial Cosmetics makes some amazing polishes - gorgeous shades and finishes. 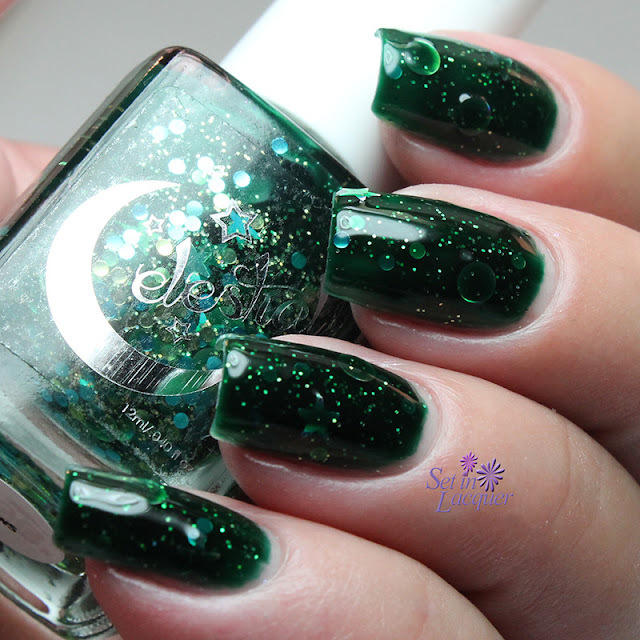 Today I have the Limited Edition November 2014 polish to share with you. This shade is an amazing shade of sky blue. 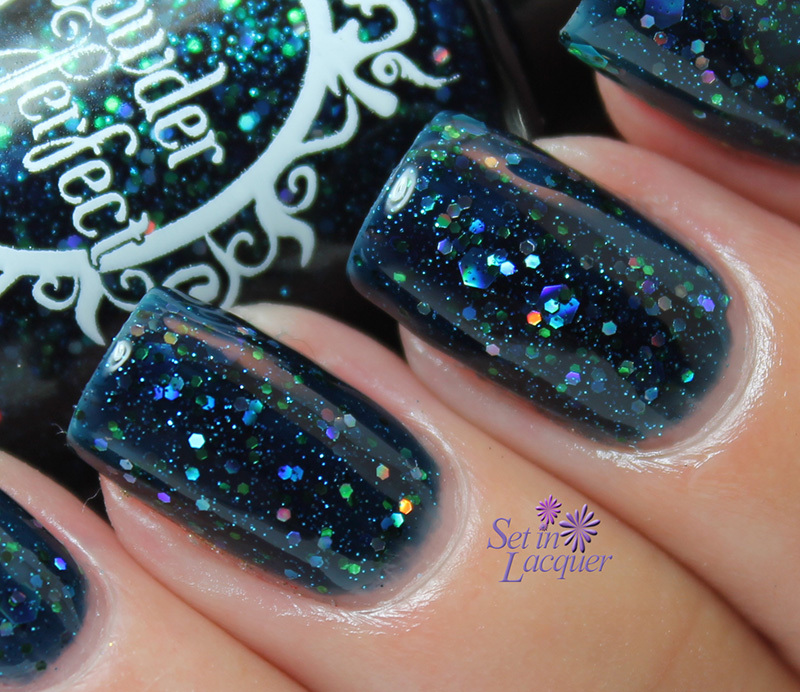 This mesmerizing blue is scattered holographic and has silver flakes. It's a beauty. It applied wonderfully. This is two coats with a top coat. The scattered holographic illusion appears to come from within the polish. I love when polishes have that appearance. This gorgeous limited edition polish is available from Celestial Cosmetics and Color4Nails. 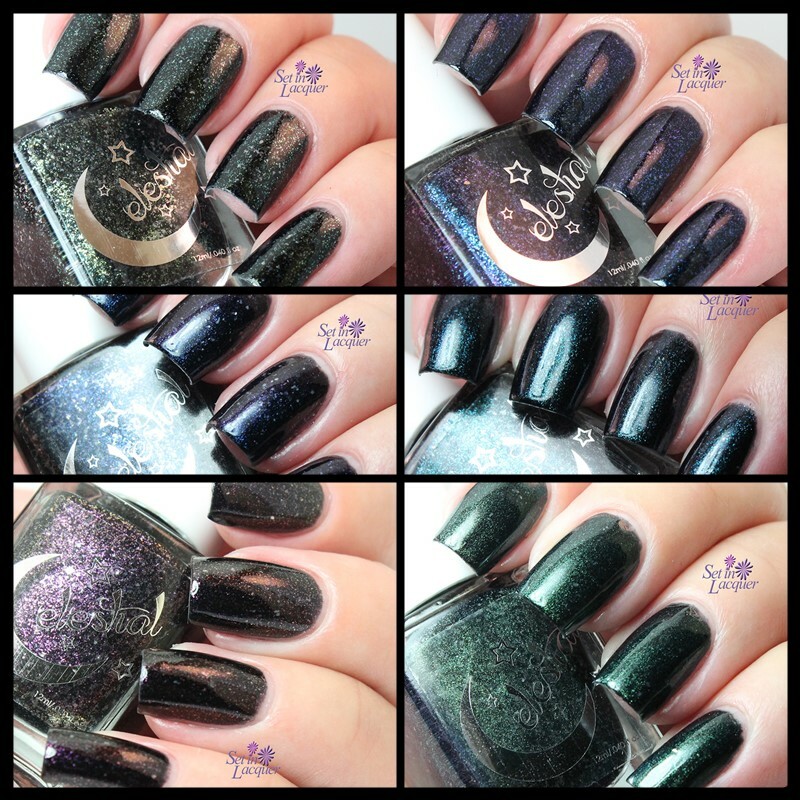 I have a new Color4Nails and Celestial Cosmetics collaboration collection to share with you today. The True Blood: Bon Temps Collection. 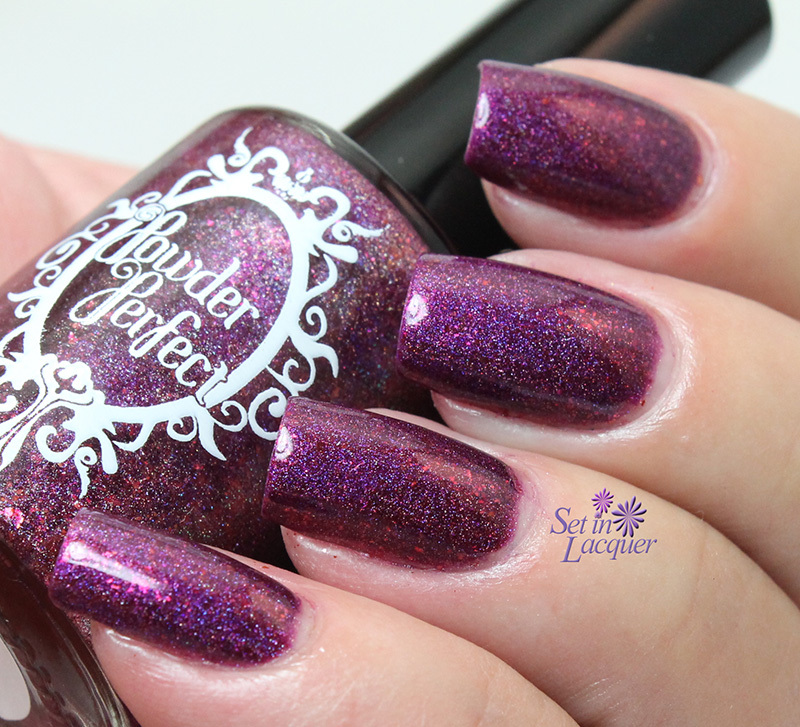 Six deep, vampy polishes that are full of shimmer and shine. These polishes applied amazingly well. Let's take a look! 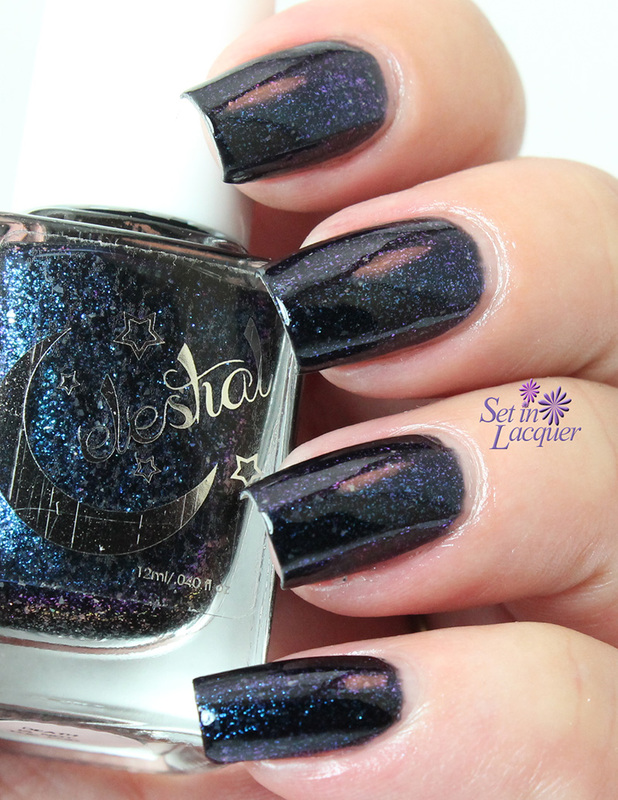 Death is Not the End is a blackened base with tons of purple and blue shimmer. 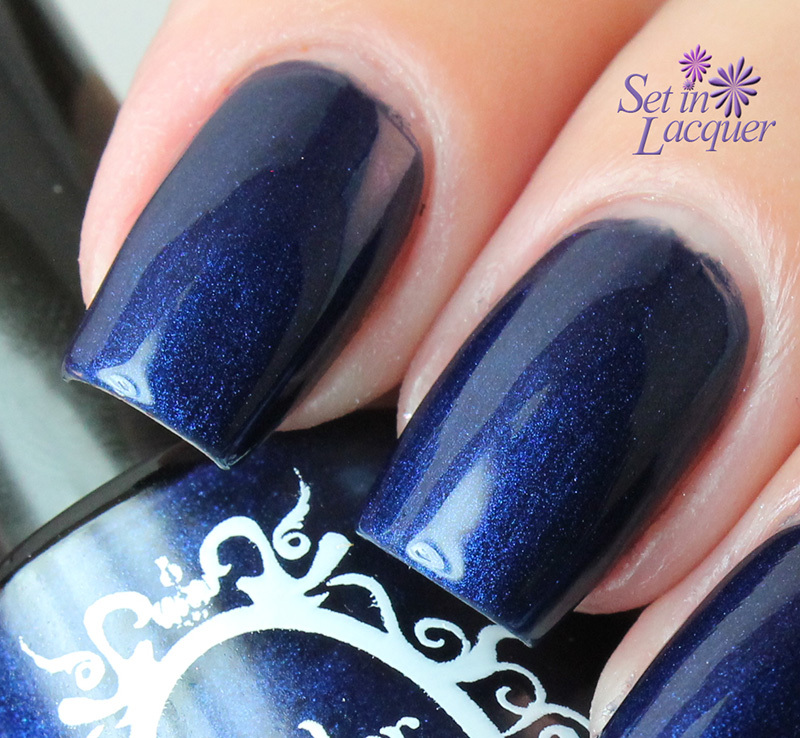 The shimmer and tiny flakes create additional dimension and depth. This is two coats with a top coat. I had no application issues with this polish. 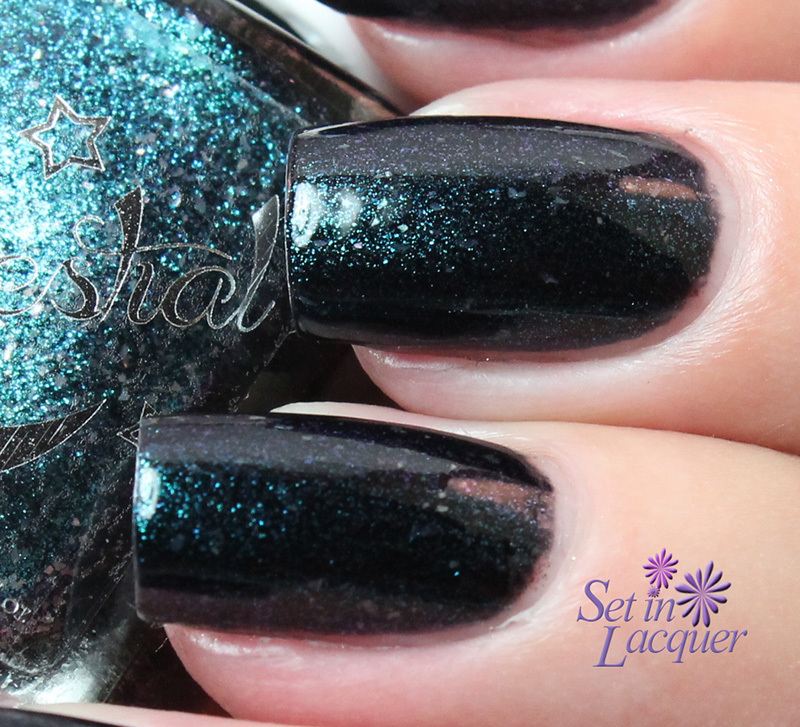 First Taste has holographic blue shimmer and flakies in a blackened base. 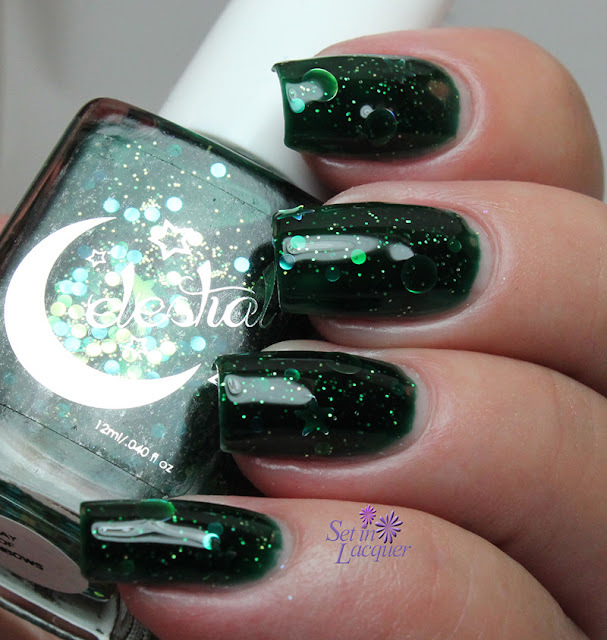 This would be the perfect base to use for Galaxy nails. This is two coats with a top coat. I had no application issues with this polish. 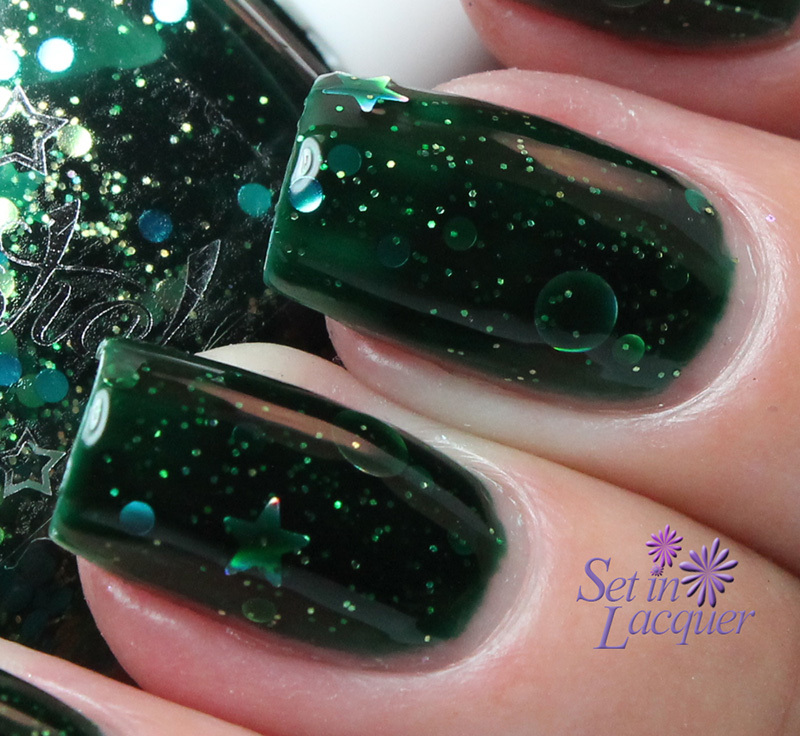 Night on the Sun is a blackened base with emerald green shimmer. 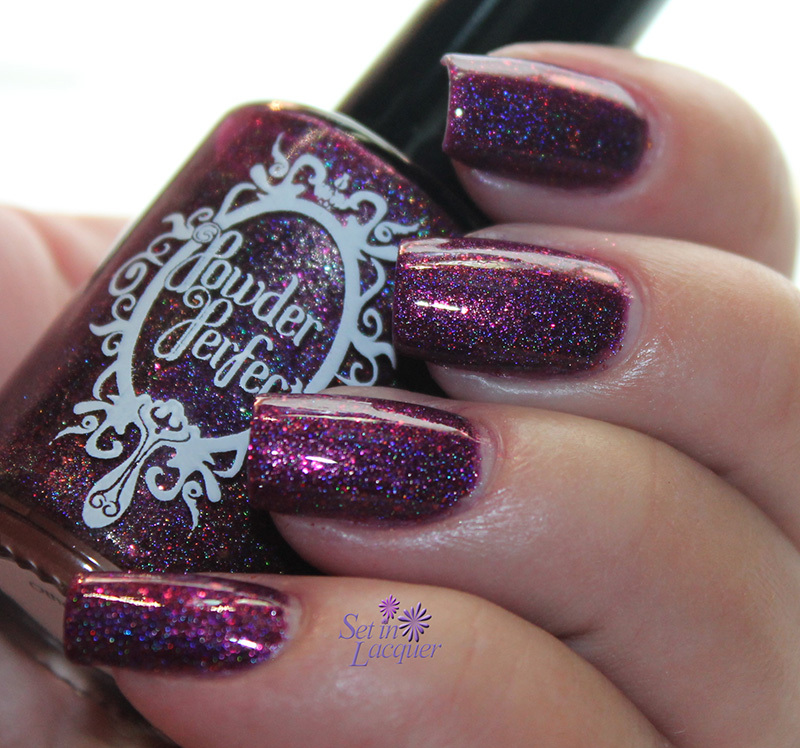 This holographic shimmer seems to come from within the polish and creates immense depth. This is two coats with a top coat. I had no application issues with this polish. 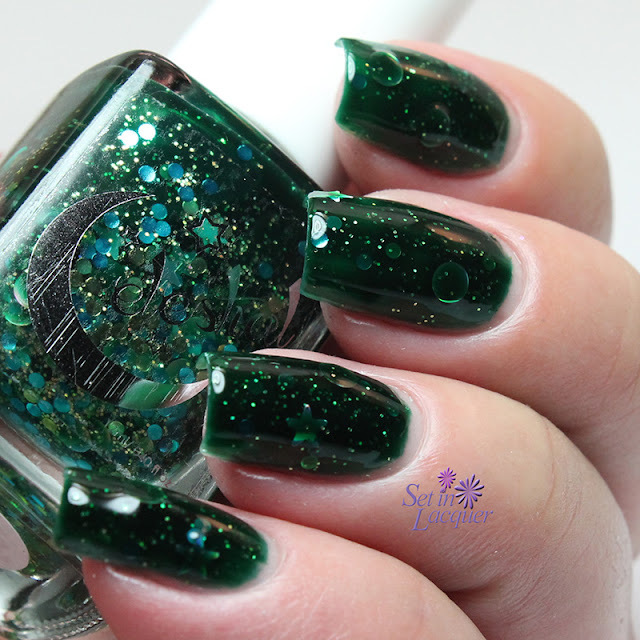 Release Me has deep holographic green shimmers and flakies floating in a blackened base. 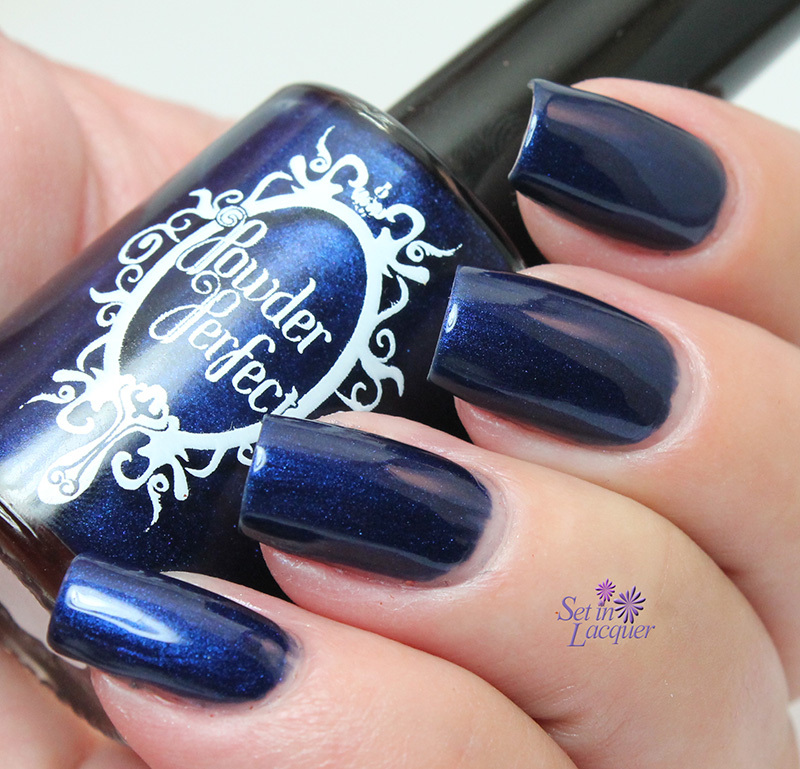 This polish has an amazing depth. This is two coats with a top coat. I had no application issues with this polish. 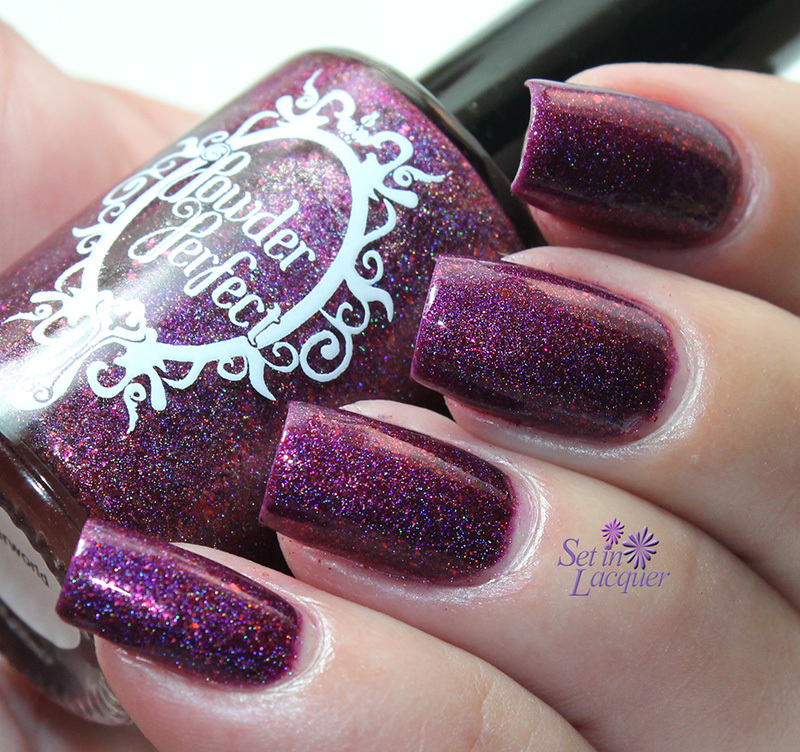 Soul of Fire has the perfect holographic purple shimmer in a blackened base. 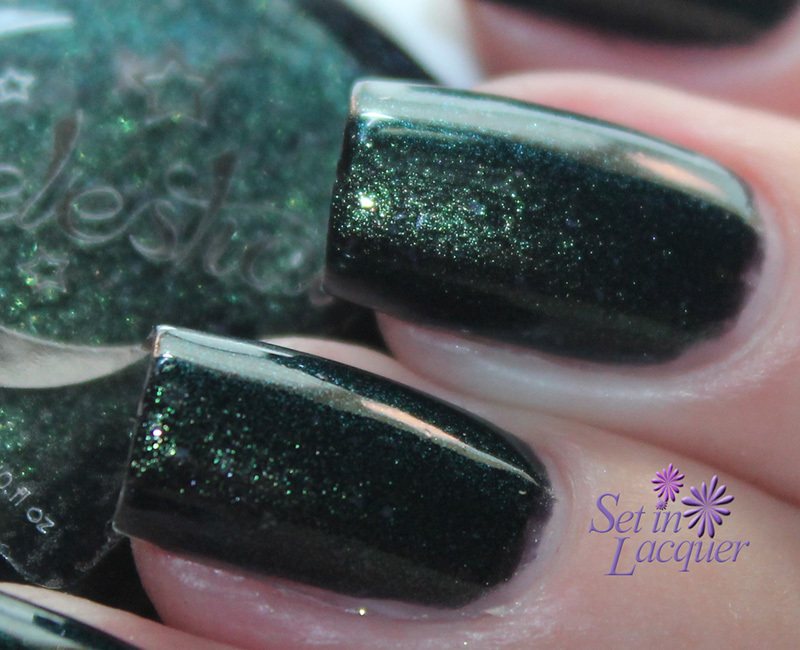 The shimmer is stunning and gives it instant appeal. This is two coats with a top coat. I had no application issues with this polish. 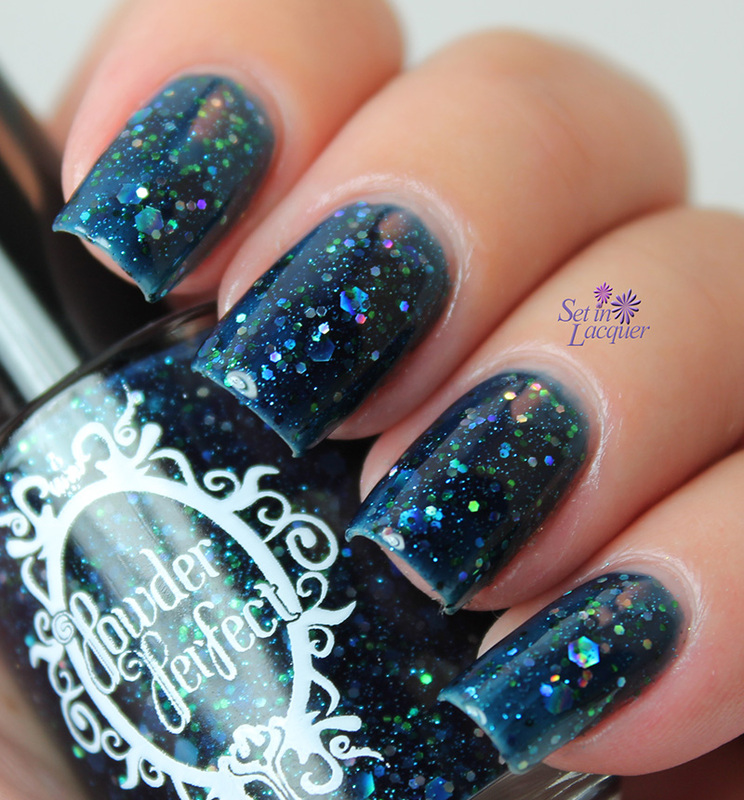 Sparks Fly Out is a blackened base with an amazing deep teal shimmer. The shimmer is obvious is all lighting. This is two coats with a top coat. I had no application issues with this polish. 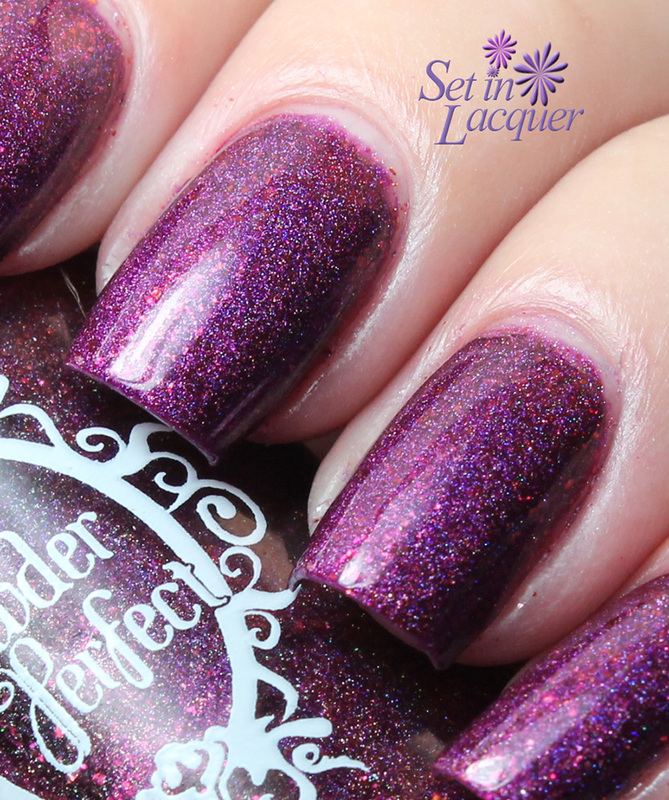 These gorgeous polishes will be available from Color4Nails on November 7, 2014.